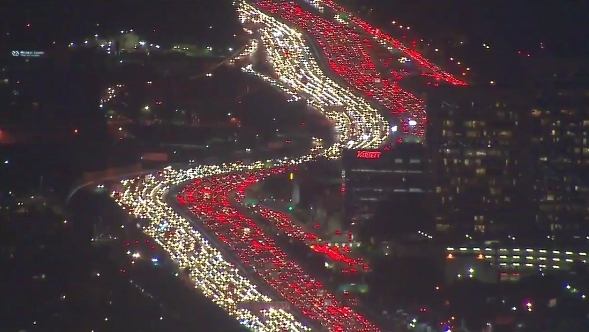 A couple years ago, I put up a post about Thanksgiving traffic with a jam on LA's 405 freeway dubbed "America's worst traffic jam." 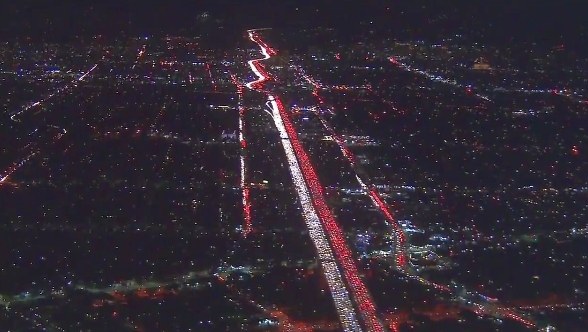 It seems this horrific traffic jam is nothing new, since similar conditions are being covered this year as well. 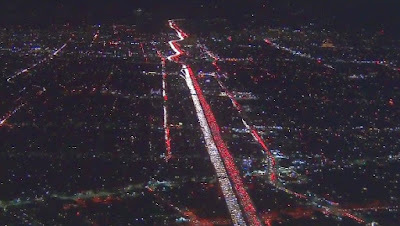 "It's like the red and white blood cells flowing through the major arteries of the city," wrote one person. "Pretty, [but] wouldn't want to be in it." This is a level of gridlock unfathomable in this area. To all my dear readers in Southern California, please be safe this holiday. Last year my husband got into a traffic jam in our town. He came to the only stop sign around 4 in the morning (had to work a distance) and an elk stood in the intersection so he could not get around him, all the yelling and honking didn't make the elk budge until he finally moved away. Quaint but true from the American redoubt area. I think this is the kind of traffic jam most would wish to endure. Every one living in Southern California made the choice of this life style. You don't want them in Montana, do you? 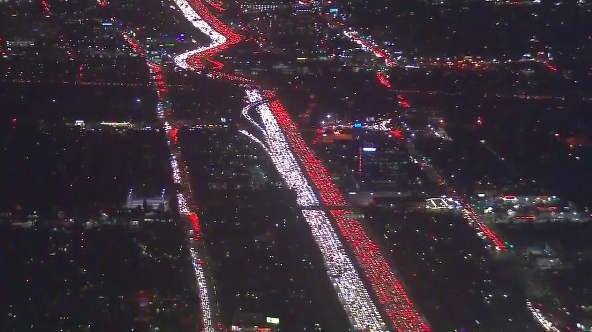 Used to go to southern California for work, I hated the traffic, but always glad they stayed on the left coast. Wishing you and yours, along with your readers, a blessed Thanksgiving with friends and family. I hope you and Don will have the opportunity to spend some time with your daughters soon. This is my first Thanksgiving without either of my parents (who have a story similar to your parents, Patrice) and I miss them, but they are together again. 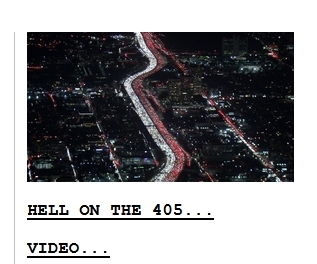 Years ago, made the mistake of taking 405. Saw the sign "San Diego Freeway", thinking that was the way to get there. What a mistake, not to be made again. A easy lesson for this farmboy the the NW. A very Happy Thanksgiving to you folks. Take care. Last Christmas we drove back and headed north on I-5 from the San Gabriel mountains. The northbound lane was fine but the southbound lane was exactly like this. And yes, this is something they chose when they moved there. Been there and done that on that freeway. I would go crazy living there. Our daughter lives there. My wife and I live in small town about 50,000 people. And I think for us the traffic jam at 8:00am and 4:30to 5:30pm is bad. Because of the kids going to school and people going to work. My daughter just laughs at me when she comes here and drives in our traffic at those times.